The aim of our kids programs is to provide a positive introduction to the sport of table tennis to the children of our host, BGCBI. We offer programs every Tuesday for an hour. Though the primary focus of our programs is for the kids to have fun, we also support the development of a good foundation for the sport of table tennis through these programs; good eye-hand coordination, basic skills of table tennis, sportsmanship and fondness for the sport. We provide individual coaching for kids with advanced skills during regular playing times four times a week. Each child has a different skill level. When we have a child at the table, we should make a quick individual assessment and set a proper goal for his/her level of achievement for that day, building upon fundamentals. For decades table tennis on the Big Island of Hawaii survived, but just barely. When I began to play the game, back in the Neolithic Period there were about six players competing on two warped tables in a tiny recreational center on the local college campus. While the television blared, someone played honky-tonk on an out of tune piano. College students clad in their last remaining clean underwear dragged bags of laundry to the machines located just behind the rec room, while new players struggled to master the basics, avoiding pool cues intruding from the felt table three feet away. 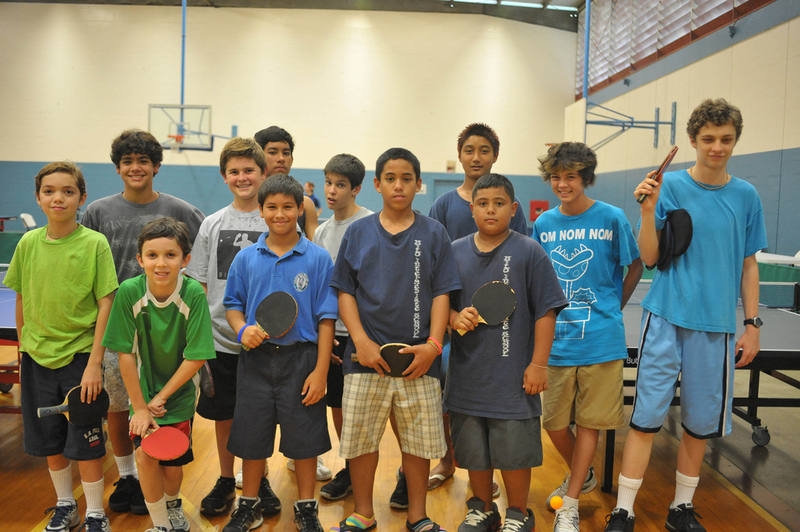 Over the years the Big Island Table Tennis Association has tried to develop programs to offer the sport of table tennis to the youth of our community, but each effort has petered out, the kids bored and the volunteer teachers frustrated. We’ve developed a solid foundation in teaching principles but we’ve lacked a system by which our club players can all contribute effectively to the introduction of table tennis to a large number of children simultaneously. Thanks to Ryoko Kimura we finally have a program that works.